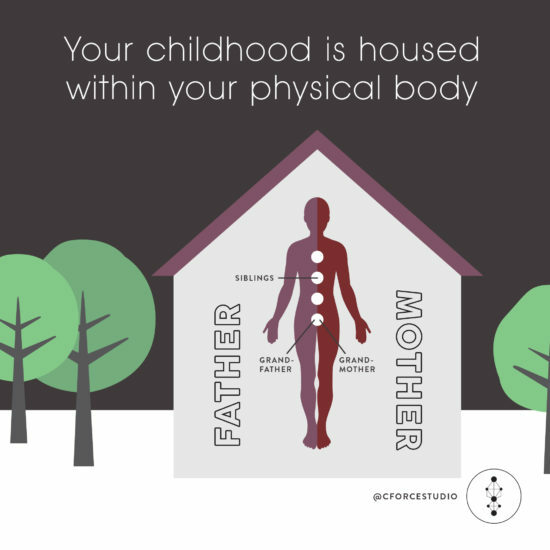 Your childhood is housed in your physical body. The emotions, experiences and people in childhood wire your body to connect or protect itself. Your mind may have buried your childhood, but your body remembers. Take a deep breath here because this is a hard-won truth. It is powerful for you to identify your pain experienced as a child, while also understanding that you must heal yourself so you don’t transmit that pain into your children. For generations, we have been unknowingly passing on this pain in the form of invisible wounds. And, it is time to stop. Take a look at your body. You will never see it the same again. Where has the puzzling pain and disease originated in your body throughout your life, this includes weaknesses and injuries? In childhood, the interactions with your parents, siblings, grandparents and caregivers hardwire your body’s electrical grid of complex emotions, messages, beliefs, traumas and defense systems to maintain health to survive. As you grow from birth through childhood, the left side of your body is wired by connections and experiences with your mother, grandmother and feminine figures. This ties directly into neuroscience. The right hemisphere of your brain controls the left side of your body movements and mechanics. The right brain is your feminine side involving creativity, artistic and big-picture thought functions. Similarly, the left hemisphere of the brain controls the body’s right side wired and influenced by connections with your father, grandfather and masculine figures. The left-brain involves the masculine side logical, math, analytical and problem-solving functions. When there is pain, injury, decline, disease or addiction in the body, we examine the grid. Sometimes the defense systems of the body mapped in childhood could be mis-wired due to trauma- death of a parent, divorce, family member with substance abuse or mental illness, sexual or physical abuse. Marital combat and/or divorce in between the parents splits the body into two sides waging constant internal warfare. In these cases, the body’s electrical grid becomes severely unbalanced. We must rewire the destructive patterns in our lives and bodies, as we become adults and parents. Herein lies the challenge. 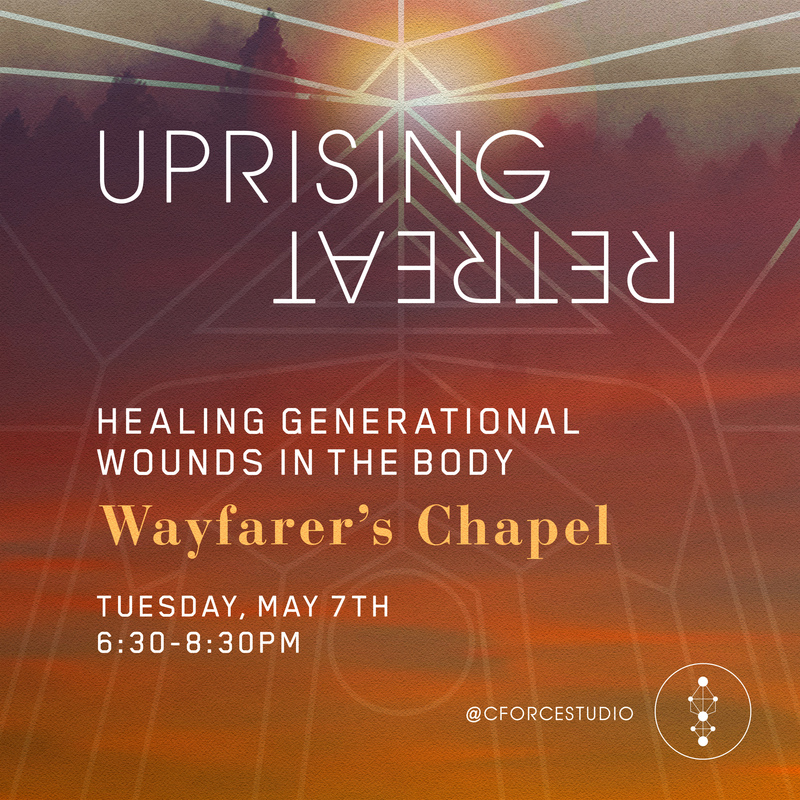 Your body’s grid also contains generational wounds passed on from your parents and their parents, your grandparents. The mind and body is a cellular network for electricity or energy to flow through, breaks in the circuitry occur when there is an unresolved trauma, grief or body violation suffered. The wiring becomes broken and whole areas of the body go dark, think of a blackout on an electricity grid. The blackout areas are the invisible wounds from your childhood. These unplugged or damaged areas of the body become susceptible to mysterious decline, injury, disease, chronic pain or an incessant need to numb – addiction. In these cases, we hear people say they feel hardwired for self-destruction or cursed. The grid or the cellular network designed to maintain health and balance is offline and deficient in these neglected regions of the body. In fact, your body is an electrical roadmap to healing the roots of childhood and generational pain. If the pain and disease is radiating on the left side of the body then we unravel the emotions and emotional experiences tied to your mother. For example, your left hip, knee, shoulder, arm and the left side of your back, as well as organ systems such as your heart are tied to your mother wounds and maternal line unfinished business. If the signals of pain and disease are originating on the right side of the body through the right hip, knee, shoulder, arm and right side of your back, and/or organs such as the liver then we start by unraveling the roots of your emotional connections and experiences with your father and paternal line unfinished business. As an example, we worked with a young woman with chronic back and pelvic pain. The entire right side of her body was weak collapsing from scoliosis, right knee injuries as well as a rotated right side pelvis with chronic pain and later right ovary cancer rooted in a childhood plagued by divorce, death of her father at a young age and a deep generational father wound passed on through the paternal and maternal lines due to war and poverty trauma. Or the flip we see a young woman with breast and lung cancer on the left side rooted in a deep maternal line wound – a broken heart going back two generations when her maternal grandmother committed a moral injury of abandoning her young son. The solar plexus and/or the core of the body that houses the abdomen, immune system and digestive system often relates to sibling influences, connections and experiences. The struggle and competition for emotional nourishment, love, attention, power and resources in childhood can be related to the presence or absence of siblings. If one parent is a narcissist or acts like an eternal child then you may have a sibling relationship with your parent in the competition of the love and nurturing from the only capable parent. How our body interprets balance and equality, scarcity or abundance, spins on the axis of our sibs and parents in the childhood home. There are invisible forces that inevitably bind sibs together. We see the same generational wounds surfacing and unraveling in siblings. 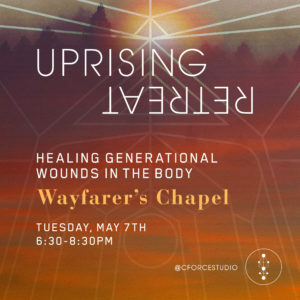 The science of the family and body are so interconnected that we must explore both simultaneously to heal pain – the body’s signal of crisis. Make an appointment with Gina Calderone, the Physical and Energetic Therapist, and Denise Carson, the Body Journalist, to map your childhood pain and heal your body to ensure you don’t pass on pain and disease to your children, and their children.